Migraine is a multi-factorial disease with a variety of potential causes. The pathophysiology is not so clear; however, there is evidence of meningeal inflammation role in migraine pathogenesis. There are many contributing factors, for example stress, neuroendocrine imbalances, weather change, and food. Food is one of the well-known triggers. Several articles have been published that confirm a relationship between migraine and allergy or intolerance to certain foods (Monro and others, 1984; Mansfield and others, 1985; Pacor and others, 1989; Guariso and others, 1993). 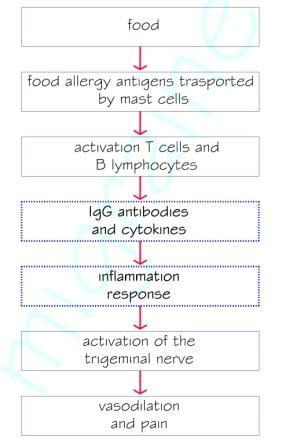 Recent studies have found out that in some cases food allergies mediated by IgG may cause migraine (Hernandez and others, 2007; Alpay and others, 2010). Based on the studies in this regard it seems reasonable to deal with migraine trying to reduce the inflammatory state induced by an immunological reaction to food. During the migraine attack blood vessels in the head pass from a state of extreme constriction to a fast dilatation. The interaction between brain chemistry and blood vessels dilation is not so clear, but scientists believe that migraines are due to specific alterations in the nervous system of the trigeminal nerve signals leading head and face to the brain. During a migraine attack, the trigeminal nerve releases neuropeptides, which cause inflammation and dilation of blood vessels. Some of those neuropeptides are the calcitonin gene-related peptide (CGRP), the neurokinin A, and the substance P. Serotonin, which is a neurotransmitter, regulates pain signals via the trigeminal and it seems that a change in Serotonin levels may cause the migraine attack. Various combinations of stimuli (food, food additives, stress, flashing lights, loud noises, etc.) contribute to the beginning of an attack. Then, a thing to consider for migraine sufferers is certainly the relationship between headache and nutrition. Apart from the known risk foods (wine, chocolate, for example), we must turn our attention to everyday foods, which have developed a food intolerance. This is important especially if the patient does not respond to symptomatic therapy. Some food macromolecules, especially if you have a damaged intestinal mucosa, may encounter the blood and lymphatic system, triggering a reaction of the immune system. This gives rise to a generalized inflammatory process that can also reach the brain. As shown by a study published on Cephalgia in 2010 most migraine patients seem to be IgG positives for several foods. Another proof of a role of IgG antibodies against food antigens in migraine attacks is the clear association between migraine and celiac disease and the improvements of migraine in celiac patients who change to a gluten-free diet. The first study to analyze the possibility of a diet control in order to reduce IgG reaction was made in 2007 by Hernández, Pinto and Montiel. The study was based on the idea that each patient needs a therapy based on his own individual clinical history and that some patients had allergen-specific IgG suspected to be involved in migraine mechanism. They considered the presence of allergen-specific IgG in serum of patients who were refractory to traditional treatment, in order to understand if it was possible to reduce migraine attacks with an elimination diet. Firstly, they investigated the most reactive food antigens in different human disease and evaluated the presence of IgG against those allergens in patients with migraine and in the non-migraine control group. The table below shows how IgG are more elevated in patients with migraine than in non-migraine control group. Secondly, they put patients under specific elimination diet, according to their individual results. In conclusion, the study suggested that was reasonable suppose that giving up some food, migraine attacks could be reduced in some patients. The study confirmed that in the elimination diet period, number of headache days, number of attacks with acute medication and total medication intake showed significant reduction compared to the provocation diet period, even if attack severity and attack duration did not change significantly. The studies considered have demonstrated that there are evidences of the correlation between food and migraine and in particular that is important to investigate the possibility of an IgG reaction against some food elements in migraine patient. Starting from these results, other studies in the future will be able to reinforce this argument. This concept of the possibility for food to trigger some symptoms is carefully watched by the healthcare system, in order to investigate possible causal relationships between food intake and specific disease. Of course, food is not the primary cause of migraine, but it is a trigger factor (it can induce or aggravate migraine attacks).